Last edited by G.G (gecko girl); 07-15-2017 at 12:27 PM. Thanks for researching before you get the gecko! Feeding can be a difficult topic, as can supplimentation. When they are babies you feed every day, I will reccomend a schedule that will change as they mature into adults (Starting at 12 months). Feed as much as they will eat in 15 minutes at first, then you can average that and feed them the average number of bugs they consumed when you let him/her eat as much as they want in 15 minutes. Feed more if they act hungry and as they get larger, or increase insect size (The insect must always fit in the space between their eyes). Unwanted beatles can be used for breeding! I personally do not put my mealworms in the fridge for better gutloading, then I get pupa and then they transform into my breeding beatles, you could try breeding to save money! But if you don't want them then you will probably have to kill them yourself, sadly. •Use Zoo Med Repti Calcium with D3 at 1 feeding per week. Lightly dust it on half the crickets or dubia, not every insect at that feeding. •Use Zoo Med ReptiVite multivitamins without D3 at 1 feeding per week. Lightly dust it on crickets or dubia. Maybe only lightly dust half the insects at that feeding. •Use plain precipitated calcium carbonate at 1 feeding per week. Lightly dust it on crickets or dubia. Precipitated calcium carbonate is purer than oyster shell calcium. The NOW brand sold in health foods stores is ideal. Would you mind telling us what suppliments you have currently, if any? Those above are very good suppliments I reccomend. The schedule PoppyDear shares above is wonderful. I would NOT keep even plain calcium in the enclosure 24/7. Too much calcium coats the digestive tract and actually impairs absorption of the very vitamins and minerals one dusts with. 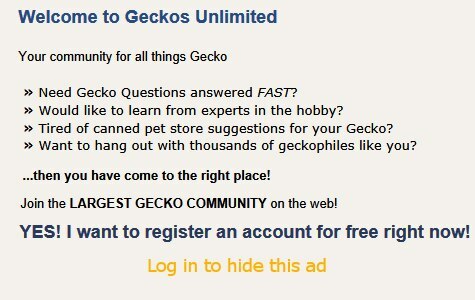 Keep GU in mind for all things gecko related. I thought mealworms where pretty much garbage? Mealworms are significantly higher in fat and chitin than some other feeders like crickets. Some of their nutrition depends upon what they eat. Last edited by Elizabeth Freer; 07-27-2017 at 12:01 PM. Click: Why I recommend Zoo Med's Repti Calcium with D3 & Zoo Med's ReptiVite multivitamins without D3? Last edited by Elizabeth Freer; 07-27-2017 at 09:44 PM.